I know I should be covering Ringu, the original Japanese film that spawned this remake, based on a novel by Koji Suzuki. 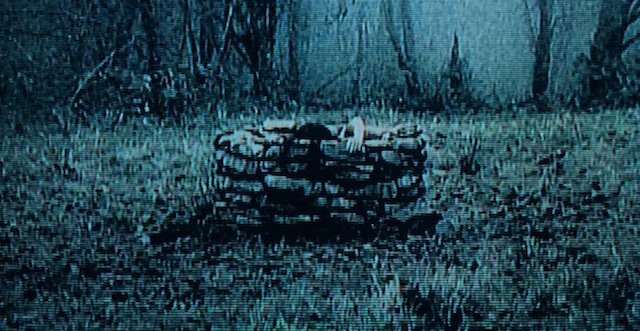 However, I saw The Ring first, which means the film’s gut-punch of a twist ending was spoiled by its American remake, and the original film lacked that same punch when I saw it a few years later. I like the original, but I think The Ring, unlike so many of the remakes that followed in its wake, has enough style and distinction to stand on its own. I know it’s probably cinema heresy, but I prefer The Ring to Ringu, although I acknowledge that preference is probably due to initial exposure. Horror is subjective, and sometimes it’s the initial exposure that leaves the lasting impression. My memory of seeing The Ring, the Gore Verbinski film that spawned the Asian horror remake trend, is forever seared into my brain. I was in high school and had seen more than my share of R-rated horror by that point. I went to see it late one night after play rehearsal because it had gotten decent reviews. I wasn’t expecting it to be scary. After all, it was PG-13. How bad could it be? As it turned out, I watched the film with a sense of ever-increasing anxiety and terror. Once the film’s twist occurred, I was biting my hand to keep from screaming. I had to drive home, forty minutes on a dark country road, and I arrived home to a completely dark, empty house because my parents had gone out to a concert. I ended up sitting in my car for nearly an hour, too terrified to actually go inside. The Ring messed with me, and as a result, I fell completely in love with it. The premise sounds absurd. There’s an urban legend-styled tale of a video that kills you seven days after you watch it. Rachel, a reporter (Naomi Watts) finds herself investigating the rumors after her niece dies under mysterious, seemingly connected circumstances. Of course, when you find a video that seems to be racking up a death toll, you do the only logical thing you can. You rent a cabin, pop that baby into the VCR and watch it, which is precisely what Rachel does. Unsurprisingly (Seriously, what did you think was going to happen? ), she finds herself, along with Noah, her ex (Martin Henderson), and her son (David Dorfman), in the vengeful ghost’s crosshairs with a limited amount of time to discover the video’s secrets. If there’s a criticism to be hurled at The Ring’s narrative, it’s that the film’s ending ultimately makes the entire film’s search for answers pointless. Characters that survive do so by a fluke, not due to any revelations. However, watching the film for the first time, you don’t know that. The presented mysteries simply seem worthy of solving and the answers obtained come off as wholly satisfying resolutions. The search also has more than a few twists of its own, which alone makes it worthy of inclusion. The movie is legitimately scary, and Naomi Watts, as an older than average horror heroine, commits to the loopy premise thus helping ground it. We believe it, because she comes to believe it, and we find that video, riddled with mundane images that feel spectacularly sinister, just as frightening as she does. Images of frightened horses, an insidious farmhouse, and that titular ring, coupled with the film’s gorgeous but unsettling, blue-green tinted aesthetic, give it the feeling of taking place in a world that feels like a cockeyed version of a place we recognize. Verbinski has a strong visual eye, even his worst films are technically accomplished, and The Ring looks phenomenally beautiful and scary. Every image looks slightly water-logged, which makes sense when we discover what actually befell the young girl who spawned the cursed video. The film keeps its tension coiled tightly, as the constantly ticking clock continues to pull until it feels ready to snap. It’s effective in ever-escalating horror, which leads to what appears to be a peaceful resolution. And then…(spoilers here), the twist hits. Rachel tells her young son everything is okay. They set the poor ghost free, and the son stares at her like he can’t believe she’s done something so foolish, and she realizes nothing has been solved. She’s been spared for reasons she’s yet to figure out, but her son and Noah remain targets. We then watch in terror as that well appears on Noah’s screen, and that pale, ghostly girl with the black, stringy hair, emerges, slowly breaks the fourth wall, and crawls through the tv screen into his apartment, leaving him dead. It’s a chilling, nail-biter of an ending at a time when horror twist endings were not as common as they are now. I remember the absolute terror and disbelief I felt when I watched the film for the first time. It’s an ending that takes the very appeal of horror films, that they’re safe scares confined to the inside of a screen, and uses it against you. It’s the ultimate fear you felt as a child watching scary movies: that those images on the screen could break into the real world and annihilate you. In the end, it’s fitting that it’s the act of sharing a horror film, rather than the act of discovery, that provides salvation. As with most horror films, it’s not the answers that matter, horror just needs “to be heard” or seen. Did you prefer the Ring 2 to Ringu 2 as those two films went compketely different ways. I thought ringu 2 was better. I also thought ringo 0 was very good. Surprised they didnt remake that in Us. By the way I thought The Grudge was better than Juon The Grudge.